Big, deep, slow, resonant breaths, all the way down into your belly. Think to yourself: inhale relaxation, exhale tension. Breathe like an opera singer, really letting your shoulders drop and your belly expand as your diaphram drops waaayyy down. Now you’re getting the oxygen your body deserves. Do you feel the difference? The relaxation? This technique will serve you in so many ways through so many stressful situations. Practice it! Realize that you have the power to choose. Always! While we may think we have no choice in certain situations, because we feel pressured or even forced by society to do certain things in a certain way, or even constrained by our own perfectionist standards, the fact is we always have the power to choose. If you are torn between going to get your hair done (because you want to look good at the office party) and taking a riding lesson this week, realize that it is your choice. Rather than telling the instructor, “I don’t have time to ride”, which makes you feel like a victim, you can say, “I choose not to ride”, which leaves you feeling more in control. Or, you can choose to take the lesson, leave your bangs in your eyes, and go to the party anyway, and it might even be a great conversation starter! Short schooling sessions with your horse, reinforcing the things he already knows, will leave both of you walking away feeling happy while maintaining his baseline fitness and the horse-human bond. Even a twenty minute ride can be productive. Suppleness lies at the base of the training scale for both horse and human, making it a great thing to focus on during the holiday season. Even if you choose to let some other things go, you can make flexibiilty a priority, leaving both partners primed for a strong return to full work in the new year. For your horse, you can structure twenty to thirty minute rides with a forward-downward stretching emphasis, to supple his topline. For yourself, decide to take lots of mini-micro stretch breaks throughout the day, for example doing the Fold, Drop, and Roll and the Overhead Whip Pass. 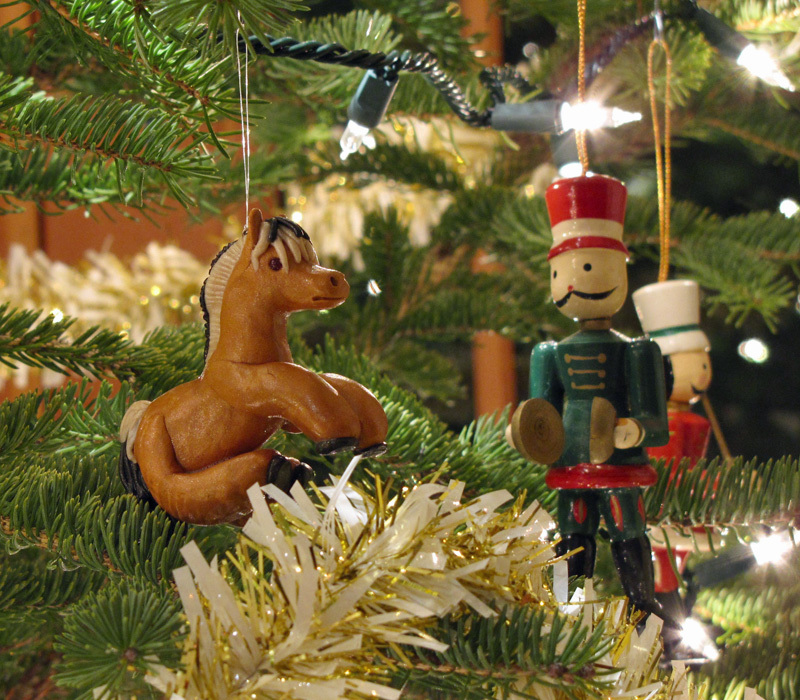 Have a Happy, Horsie, Holiday! 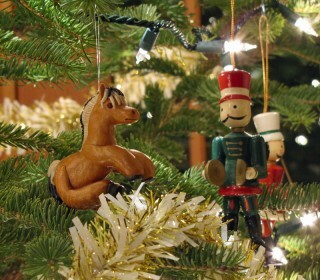 What other strategies for staying sane, centered, and connected with your horse through the holidays do you have? Let me know in the comments. Just wanted to drop you a note to let you know whenever I open my computer and I have an email from you–I rush to open and read. I have LOKI, my 7 year old gelding and and your training ideas have helped us alot. For 7 months I’ve dealt with some health issues that have required me to ride with someone else but I’ve always felt that safety in numbers is good. We always do some ground work first and I’ve passed level 2 freesytle in Parelli so that has built a very good foundation. Your concepts are so perfect for us–Simple, straightforward and centered always. Although I often don’t ride more than 45 minutes–we always end on a quality note and both of us are happy and our bond is further enhanced. Thank you again for your continued guidence! Photos to follow! Margery – It does my heart good to read that. Thank you! And I look forward to seeing those pics of Loki.